One day I stopped at the Fort Wayne Railroad Historical Society restoration building in New Haven–what an interesting place! 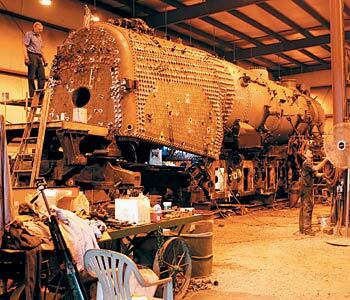 The old Number 765 steam locomotive was completely disassembled for restoration. I could hardly imagine the work involved, as many of the parts are huge and weigh tons. This initial visit piqued my curiosity, so a few days later I stopped by again. It happened to be “work week”, and there were about a dozen people working on the engine. For a nominal fee, a volunteer will show you how to operate a diesel locomotive, using a working diesel engine built in 1953 and donated to the society (you need to be at least 18 years old). For railroad buffs, I can't think of a more interesting place to visit.New Haven is just east of Fort Wayne, which is in northeast Indiana, where I-69 and U.S. Highways 24, 30 and 33 converge. The society's restoration building (15808 Edgerton Rd.) is 5 miles east of New Haven; visitors are welcome from 9 a.m. to 4 p.m. Saturday. It's also open occasionally on other days; to find out, and for directions, phone 1-260-493-0765 or check out www.765.org. The engine is now completely retrofitted and running. They are now working on other equipment.